Doctor Who- 7th Doctor | The Daily P.O.P. “Redvers had some stories… The pygmies led him blindfolded for three whole days through uncharted jungle. They took him to a swamp full of giant lizards like giant dinosaurs. “Do you know young Conan Doyle just laughed at him? As part of an initiative test, the Doctor has taken Ace to an unknown location for a surprise; a seemingly normal Victorian house which is anything but. A diabolical alien known as Josiah Samuel Smith has taken over the house, bending it to their will with one goal, to assassinate the Queen and take over England. Deep in the bowels of the house, Smith has a pair of prisoners, one a bestial creature surviving off of scraps, the other revered as a God by a primate, impossibly serving as a man servant. The Doctor plays the mad house as a master manipulator, a role that developed through McCoy’s brief run in the part. Playing with Smith and the other tenants of the house, he appears to have the situation well in hand, but the truth of the matter is something other. In his attempt to teach Ace a lesson, he has exposed her to one of her darkest memories, a haunted house that she had firebombed as a teenager. By bringing her to the same house earlier in time, the true horror of the haunting is evident and it could potentially crush her psyche and her trust with the Doctor. The final season of Doctor Who is, in many ways, it’s most ambitious and adult in decades, certainly since 1970 when the program re-invented itself. The scripts were more far-reaching and diverse in their directions, from the straight forward and lighter Battlefield to the intense Curse of Fenric and Survival, a story which appears to be yet another Master adventure on the surface but is deeply embedded with meaning. 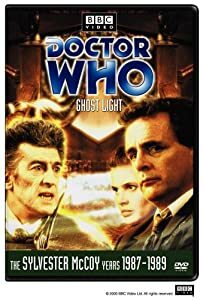 In the case of Ghost Light, author Marc Platt adapted a tale that was intended to explore the Doctor’s family into one that more fully developed the companion Ace while utilizing the amazing aptitude of the BBC to craft beautiful period dramas. This is a story that has a lot of naysayers and for good reason; it is overly complicated and crammed into three parts when four would have been better, McCoy is not exactly up to the demands on him and it is very difficult to even talk about what happened. For me, it is a special story that I hold a lot of care for simply because of the mood, set design and guest cast. The script is rushed and awkward at times but also brimming with evocative imagery and moving emotional exchanges. 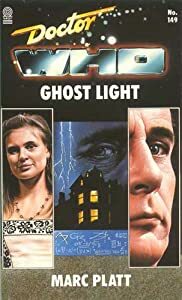 Ghost Light functions as a horror story, a cerebral thriller, a science fiction tale and a domestic drama. It’s marvelous. The ‘monsters’ of the story, a pair of husks that ‘Josiah’ had discarded as he out-evolved his previous forms, are memorable creations. I quite like the image of creatures in tuxedos launching attacks from behind velvet curtains. Smith himself is a suitably insidious villain, oozing with charm and malevolence, he even tries to buy the Doctor’s services! Additionally, Michael Cochrane as Redvers Fenn-Cooper is outstanding; a big game hunter wandering the halls of the house with an elephant gun, recounting his adventures in the jungle, his mind shattered. When the facade is pulled back and the Doctor frees Josiah’s prisoners, things get a bit… overloaded. Both ‘Control’ and ‘Light’ threaten Josiah’s plans as they develop their own. Light is an alien that started a catalog of all life, took two samples, one free to evolve into other forms and another that would remain static. The first got ideas above his station and imprisoned his master and the control subject. Now free, Light is frustrated to see that his catalog is useless and vows to destroy all life on the planet. Meanwhile Control has become ‘infected’ by the same evolutionary bug that drove Josiah to dreams of empire, but in her case she simply desires to be a lady. There is so much to love about this story… but a lot that hampers its enjoyment. Sure, you have to watch this story very closely, paying clear attention to it (possibly twice) and even then you may scratch your head wondering who or what ‘Light’ is. That’s a failing in the story as the dramatic potential is undercut by a plot interlaced with layers, characters and revelations that all play out in concurrence. The story does not always play to its strengths and can easily lose even the most devoted fan. Some of the performances, such as Ian Hogg as Smith, are extraordinary, and while McCoy has some outstanding moments he also gurns at the camera so badly I wince in pain *for* him. Doctor Who in 1983 was, even at its best, formulaic. In 1989, it was trying something new, something that the new series could take some lessons from. 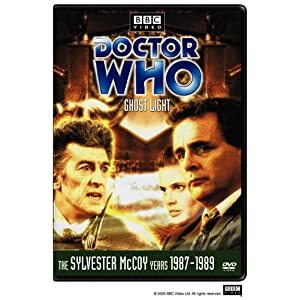 Even at its worst, Ghost Light tells a complete story that develops the companion, uses the Doctor, has monsters and an amazing guest cast. A true gem of the classic program, this story deserves an other look. Arriving on the coast Northumbria, the Doctor and Ace saunter into a top secret naval base busily deciphering Nazi codes. At the same time, a small platoon of Russian soldiers flees their sinking vessel, landing on the coast to retrieve British Intelligence. Inside the base, the most intelligent incryption device ever developed, the Ultima machine, is being used to break enemy codes. Professor Judson and his superior Commander Millington have another motive, one that promises great power if they can solve the mystery of the Norse runes in the village church. In the water off the coast, a timeless evil waits, sculpting metal trinkets with their bare hands and pulling sunken bodies to the depths, turning them into inhuman creatures. The Doctor is putting the final moves on a game he started long ago. He has worn many faces, but the Doctor is now taking on a role of champion against the forces of darkness. In ancient Arabia, he played chess with an evil spirit using pieces carved from human bone. The Doctor tricked the evil entity into a trap, but Fenric had his own plans that stretched throughout time, leading to another confrontation with the Doctor. I tend to indicate The Curse of Fenric as the last gasp of greatness for Classic Doctor Who. It has a period setting, alternate history, a clever plot, some outstanding guest actors and terrifying monsters. 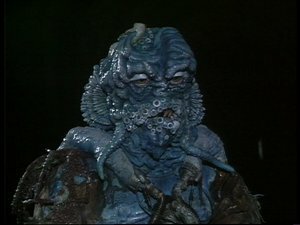 Following Battlefield, referred to as one for the lads with its soldiers and knights and Ghost Light, an intricate and moody situation drama with formal dress and bug-eyed monsters, Curse of Fenric is the culmination of work that Sylvester McCoy and Andrew Cartmell had started back in 1987. A sense of mystery was returned to the Doctor and a new direction added to the program that made it both modern and reverential to the source material. It also focused on the companion Ace, forming the final part of her character’s arc that had begun back in her first story, Dragonfire. Briggs’ plot draws from many excellent sources as the Arabian Nights, Bram Stoker’s Dracula, HP Lovecraft and even historical war records. While it does mention some continuity points such as the Doctor’s granddaughter and the chess game briefly shown on screen in Silver Nemesis, it draws strength from developing new mythologies and monsters. 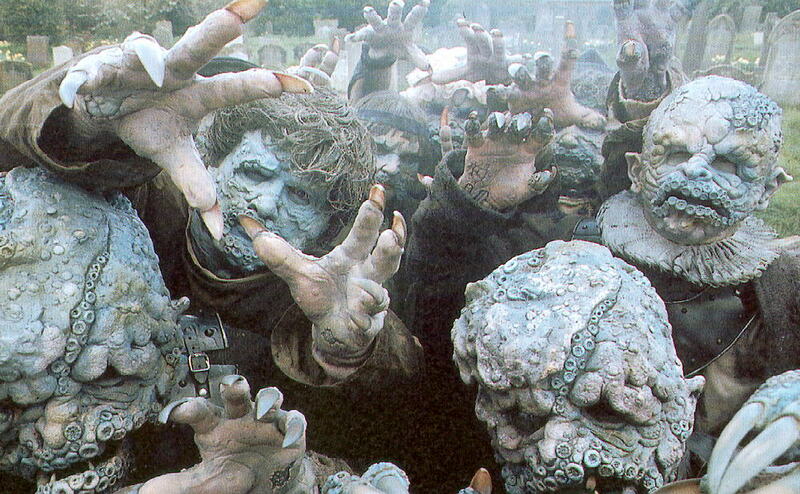 It also has some startling visuals that proudly declared Doctor Who had plenty of life left in it. The Ancient One leading an army of aquatic vampires assaulting a church is one of the absolute best moments of 1980’s Who. There are of course flaws with Curse of Fenric including dubious special effects and performances as well as some terribly bizarre dialog. Just what does ‘No one ever makes you come into the water, but everybody wants do’ mean? Why is the confrontation between the evil vampire girls and Reverend Wainright filmed on such a lovely sunny afternoon? You can even hear birdsong! Additionally, there are so many plot threads strewn about that it gets dizzying and the program attempts to resolve them all in a slap dash manner, making the end result appear amateurish at times. 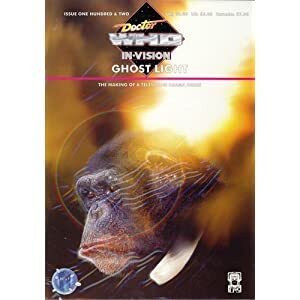 When the DVD arrived, I giddily screened it to a friend as one of the best Doctor Who stories that few had seen and was crestfallen when he lost interest almost immediately due to the convoluted plot, poor audio and some dire performances. 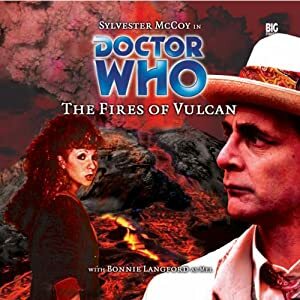 I can point to a few sore points where Curse of Fenric falters in its greatness but the biggest problem in my opinion is that it attempts to accomplish far too much, especially for a Doctor Who story. Russian soldiers land on the beach of a sleepy English village to steal a top secret English encryption machine. Millington and Judson are involved in a clandestine ploy to bomb the Kremlin with an experimental toxin, but are also pawns of Fenric, an ancient evil entity trapped in a bottle. Fenric brings the Haemovores to the 1940’s to not only cause death and destruction but have his revenge on the Doctor by creating a temporal paradox resulting in a future apocalypse. The Doctor has brought Ace to her mother’s birth to force her to accept that she can both love and hate someone and move past it… That’s a lot for one four part story (and I skipped a few ideas). To be fair, this is a case of Doctor Who straining outside of its bounds with nearly no resources and boundless ambition. 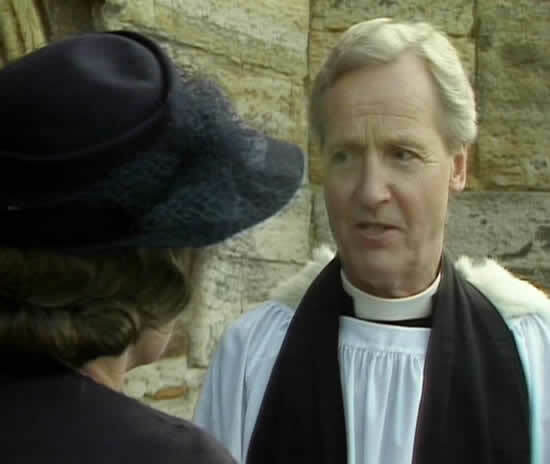 Even so, the performance by Nicholas Parsons as Reverend Wainright who struggles with his faith as his country’s army slaughters thousands is stirring and very adult for its time. Likewise, the chemistry between Alfred Lynch as the slightly mad Commander Millington and Dinsdale Landen as Dr Judson is fascinating. Landen plays one of the finest and most evil of villains in Fenric, delighting as he watches Judson’s nurse get assaulted by Haemovores yet chilling in his interactions with the Doctor. The regulars McCoy and Aldred really shine in this story, making sense out of a plot and doubtless frenzied production schedule. A classically trained actor, McCoy reveals in this final series that he is an excellent choice as the Doctor just waiting for a decent adventure. An inexperienced actress, Aldred is especially impressive here as she takes on much more dramatic material than ever before. Ace was granted so much care and attention by the production staff, but it would have all been for naught if she flopped in the part. Canceled shortly afterwards, this is a glimpse of what could be done if the BBC was courageous enough to let Doctor Who grow up. Much later, bits and pieces of Cartmell’s Doctor Who masterplan would crop up in Russell T Davies revision. Much like the Big Finish audio dramas, Davies cherry-picked ideas from this period, but sadly very little of the brilliance remained. In 1989, Doctor Who had the lowest ratings in decades. The BBC had lost its interest in Doctor Who and producer John Nathan-Turner, a man who struggled to keep the series afloat for years, wanted out. It was also a time of incredible innovation and re-invention. Doctor Who had gone from a day-glow children’s program to sophisticated entertainment combining fantasy, horror and drama all at once. Finally available on Netflix, The Curse of Fenric is an outstanding story that shows Doctor Who in a time of flux and evolution. The Ace Adventures box set arrived in the post today and I have to admit that I’m a bit over-eager to dive in. There have been much better DVD releases (and worse) and many stories that I adore, but this is a bit of a personal fave for me as it marked the period where I rediscovered Doctor Who and connected with it in a unique way. On this blog I have cited the importance of the Hartnell stories, the inventiveness of Troughton’s era and the comic book-like insanity of Pertwee’s turn at the wheel. 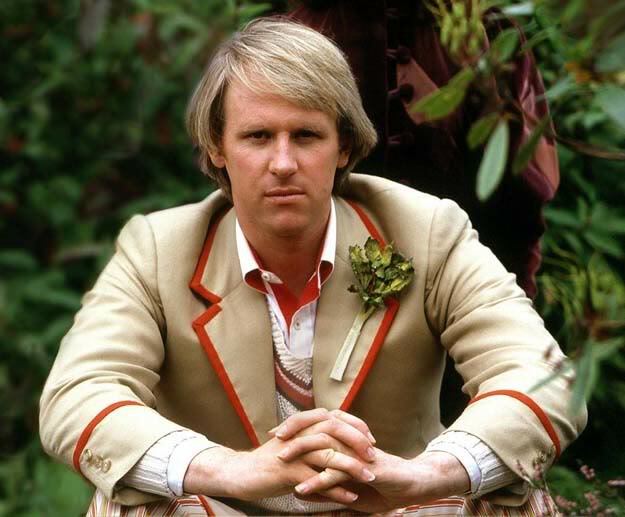 No one can argue that Tom Baker’s tenure as the Doctor was important as was his successor Peter Davison whose youthful exuberance attracted a new fanbase, especially in the US. But it was when Colin Baker scared away the remaining fans and Sylvester McCoy arrived that things got really interesting. McCoy is a love him or hate him Doctor, I have to admit. A classically trained actor, he is also a former children’s entertainer and his diminutive size and odd facial expressions make him appear comical and so strange that he might really be an alien. His arrival shook up the program and challenged the notion of what made Doctor Who what it was. The stories of his first season in 1987 have been judged as the worst ever seen, but you have to give the BBC props for innovation. At the very least, Colin Baker could look at Delta and the Bannermen and admit that there is no way he could have been in that one! Dragonfire was a game changer of sorts as it introduced Ace, a companion that would go on to become one of the most beloved characters of the 1980’s Who. A street kid transported to another planet and yet living a boring life as a waitress, she has plenty of personality and loads of determination. In her first outing she contrasts Melanie’s screaming female with a wide-eyed wonder of the unknown. She is daring, brash and reluctantly naive and inexperienced. An ideal companion as the Doctor embarked on two years’ worth of stellar stories. There are loads of problems in Dragonfire, an eerie hunt after a monster is made rather light-hearted due to intense lighting and the cuddly nature of the ‘monster’ who could barely move in any case. Edward Peel as Kane steals the show as the devilish and maniacal villain, so icy cold and cunning that he is a worthy adversary for the Doctor. The whimsical ‘treasure hunt’ plot is delightful and turns sour when the true nature of the planet is revealed and things get rather grim. The Ace Adventures Box Set also contains Happiness Patrol, a story that divides the few remaining fans that actually hold an opinion on the McCoy era. A bizarre artistic statement on the state of the UK under Margaret Thatcher, it also showcases one of my personal favorite monsters, the Candyman. I know he gets a lot of stick, but its his resemblance to a children’s program host that makes him work for me. He’s just far too silly to be taken seriously, yet he is also a blood-thirsty maniac. 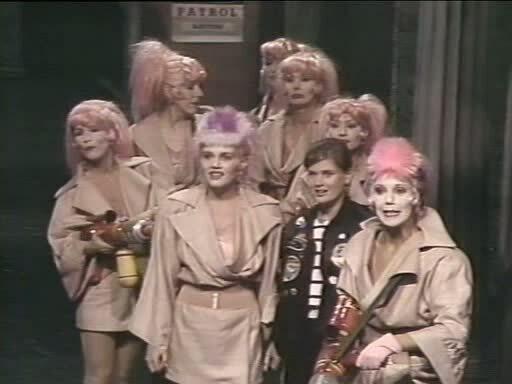 The Happiness Patrol was screen in omnibus format in the US along with Remembrance of the Daleks which I thought was perfect. Both stories were equally superb yet entirely unique. Each got heavy handed at times with their messages and Fifi was dreadful, but there’s always some component that trips up Doctor Who, even at its best (killer clams, magma beasts, cute giant rats, giggling actors off-screen). Even so I admire what the team was attempting here and felt that it was a far stronger story than Remembrance which was rather straight forward. The new era of Doctor Who appeared to be a pastel-colored kids show with a goofy lead actor and his androgynous assistant. Yet under that veneer, lurked the lotus eaters of Time and the Rani, the cannibals of Paradise Towers, the killer bees of Delta and the Bannermen and… the shocking conclusion to Dragonfire. In the case of Happiness Patrol, it was a candy floss affair mixed with pulp science fiction tidied up with a message about the dangers of tyranny and the dangers of denying sadness. Series 24 and 25 shocks and entertains while making the audience think about some pretty heavy ideas without reverting to gore or horror tactics (that would come later in the final season, which I also like a lot). There’s a cleverness and ingenuity in this period that I don’t think gets enough respect. The Happiness Patrol also included a stirring moment when the Doctor literally philosophizes an assassin out of his job. Great stuff and very iconic of the era. Ace joins up with the Happiness Patrol? This box set holds many elements that would later crop up in the BBC Wales revival of Doctor Who, but it is important to see how they were done here (and done right). Just the right amount of attention is given to Ace (she never threatens to take over the program) and the absurdity of the drama and action is incredibly over the top yet also taken very seriously. 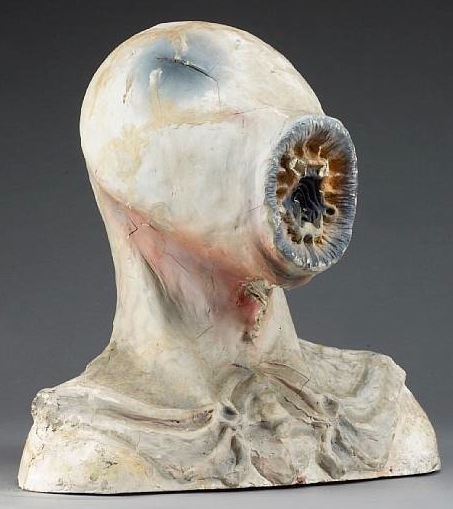 The final relic from the Graham Williams era, Nightmare of Eden is hardly regarded as a high point for the program. Dodgy special effects and wobbly walls abound and it also features the silliest accent ever witnessed since The Underwater Menace. Nevertheless, the program is light fare and the last story to be released from Tom Baker’s middle period on the program when comedy and fantasy reigned (aside from the incomplete Shada). Two spacecraft fuse in a hyperspace collision, and with the dimensional instabilities threatening everyone aboard, it’s fortunate the Doctor (Tom Baker), Romana (Lalla Ward) and K-9 arrive to help. But when a crewmember is found clawed by a ferocious creature, it seems there’s something even more frightening stalking the corridors. But what can this have to do with a zoologist, Professor Tryst, his CET projection machine, and a planet called Eden? Due for release on the 2nd April from Amazon UK. Two key adventures from the Seventh Doctor’s era are collected in this long awaited box set containing Dragonfire and The Happiness Patrol. Dragonfire bridges the light drama period of the program with the more sophisticated stories that were to come and also introduces new companion Ace (played by Sophie Aldred). A fan favorite character, Ace became one of the more popular companions of the classic series alongside Sarah Jane Smith, Leela and Joe Grant. The story itself is a bit of fun, a revenge story nested within a treasure hunt. It seems very innocent (the goofy monster helps) but you may be in for a shock in the conclusion, still one of the most memorable moments of the program. The model work of Ice World is also amazing. In sharp contrast, The Happiness Patrol is a daring social commentary that is hindered by being studio bound and a very small budget. The hand puppet Fifi doesn’t add anything to the dignity of this one, but it remains one of my all time favorites from the McCoy period. 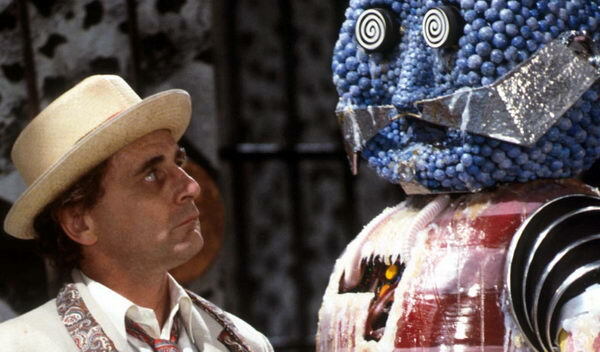 The Kandyman, an impressive animatronic suit, is a monster that you adore or despise, but it made the press by presenting children’s sweets as evil (imagine!). In these two classic stories Ace joins the Seventh Doctor aboard the TARDIS where she’s soon battling a biomechanoid and liberating a world where just feeling sad can get you shot! On the planet Svartos, the Doctor (Sylvester McCoy) and Mel unexpectedly encounter an old friend – Sabalom Glitz. Joined by Ace, a teenage waitress with a love for explosives, the group ventures off to find the fabled Dragonfire treasure. On the planet Terra Alpha, the population constantly displays happy smiles. Anyone feeling remotely glum disappears. Quickly. Having heard disturbing rumours, the Doctor (Sylvester McCoy) and Ace arrive to topple the entire regime. 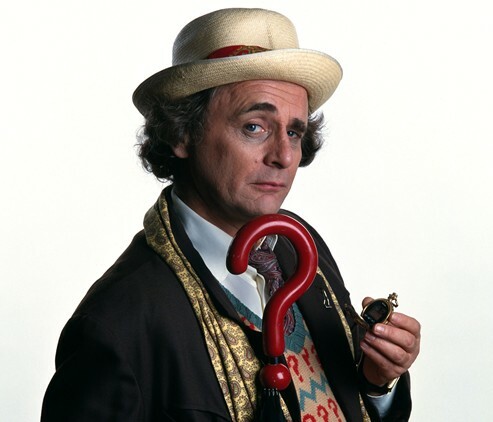 The seventh incarnation of the Doctor may have lasted from 1987 to 1989, but actor Sylvester McCoy is still kicking his straw hat and question mark-topped umbrella about at conventions. Still very active in the Big Finish line of audio adventures, he lent his voice to the speech from the ‘Pandorica Opens’ episode of the BBC Wales Doctor Who. Addressing a sky full of foes from every adventure, the Doctor challenges the might of the largest army ever assembled with nothing more than his unpredictable nature. Pure McCoy, really. A fan caught the entire scene on camera for everyone to enjoy. 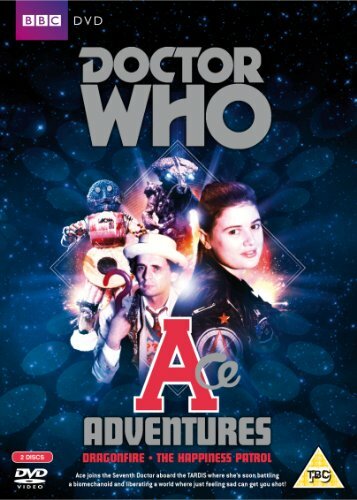 Sylvester McCoy’s adventures are available on DVD and CD. 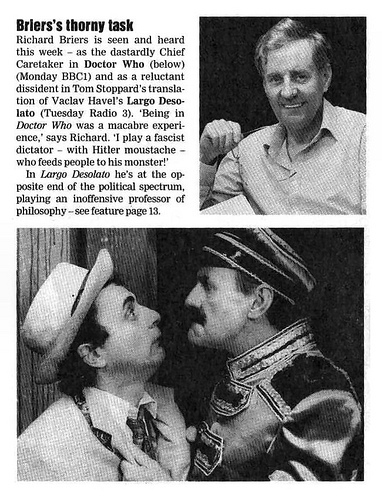 Back in 1987, Doctor Who was in a state of decline on television. After 23 years, it was starting to look like maybe BBC Controller Michael Grade had indeed been right in taking it off the air. Viewing figures took a dive after the departure of Peter Davison and that behavior continued into the following two years with the 24th looking quite dire. Despite the doom-laden look of things, there’s a lot to crow about in McCoy’s first year as the Doctor. 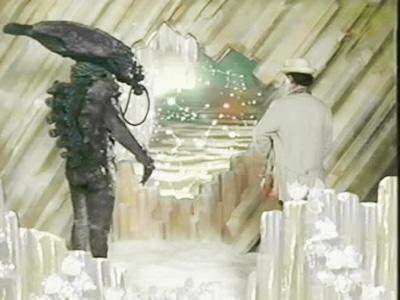 The 24th year saw easily the most sophisticated opening sequence in the program’s history, a revamped signature tune and logo along with the first computer generated imagery used in Doctor Who. 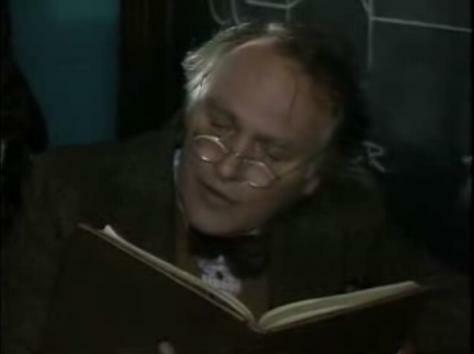 Incoming actor Sylvester McCoy took over a pair of stories not written for him and Andrew Cartmell attempted to sooth the bruised ego of John Nathan-Turner, a producer forced to stay long after he had wished to. After answering the demands of the BBC to lessen the violence, Doctor Who was softened even more becoming a pastel-colored children’s program. Moving away from the established house style, Doctor Who in 1987 embarked on an experimental era that combined light comedy with biting satire and classic adventure. That being the case, McCoy was the ideal leading man for this revised incarnation of the program with his infectious energy and flair physical comedy. 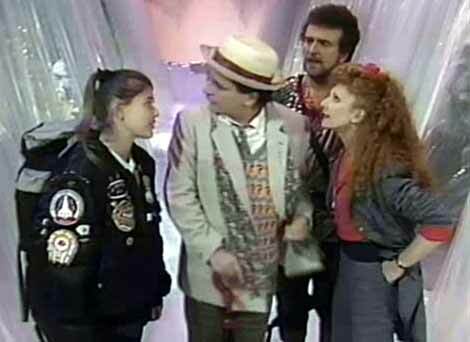 Paired with Bonnie Langford, the two led Doctor Who into an age that, right or wrong, was entirely new. 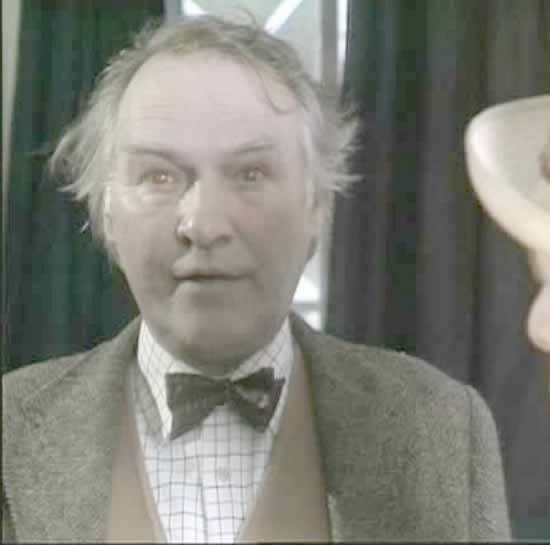 The following two years saw a vast improvement over the varied quality seen in series 24, but in 1987 fans were not happy as this vintage TV clip shows. It’s interesting to view Classic Doctor Who in the context in which it was transmitted. Compare the 1987 video to this earlier retrospective clip from 1982. Granted, the program was still in high regard and was about to enter its 20th anniversary, but still there seems to be an air of respect and adoration of a national treasure. After establishing his new persona, the Doctor takes his companion Mel to a tower block in space on the verge of collapse. A killer is at large, dragging victims to the basement to eat them up whole yet no one is interested in doing anything to stop the deaths. 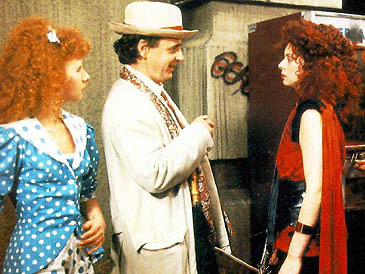 Fighting against impossible odds, the Doctor must put Paradise Towers to rights or it will collapse upon itself. Each period of Doctor Who is marked by change, be it a change in production team or in the lead actor. In 1986, replacing the leading actor of Doctor Who was not the only task set before John Nathan-Turner and incoming script editor Andrew Cartmell. Frustrated with the lack of communication and his relationship (or lack thereof) with JNT, script editor Eric Saward walked off the set of the second part of Trial Of a Time Lord, leaving everyone in a fine mess. The ratings that had fallen so sharply for the 22nd series rose slightly for the 23rd, but BBC controller Michael Grade felt that more change needed to be introduced starting with the Doctor himself. Theatrical actor Sylvester McCoy was the favorite choice due to his diminutive stature (in sharp opposition to Colin Baker’s sturdy frame) and his impish behavior mixed with an otherworldly kind of intensity. Paradise Towers was the first story to be written for McCoy but it was commissioned and written with no knowledge of the 7th incarnation. The script by Stephen Wyatt was heavily influenced by the novel High Rise by JG Ballard, a brutally violent fiction set in a scientific marvel of an apartment block where the inhabitants are trapped and devolve into primitive social castes. Both Cartmell and Wyatt were on the same page regarding their excitement to develop such a story through the strange lens of Doctor Who… and the results are mixed. The Doctor and Mel are looking for a holiday spot, something that the time traveling nomad finds wasteful. In any case, the Doctor compromises by taking the TARDIS to a state of the art masterpiece Paradise Towers. They arrive to find the structure to be a trash-ridden haven for hoodlums, patrolled by bureaucratic slobs acting as caretakers. Something has happened that has reduced the population of Paradise Towers into craven cowards scavenging for existence while an unknown menace kills off any of the unlucky ones. The Doctor must not only discover the source of this threat but unite the people of Paradise Towers in the face of a common foe. There are many influences on the modern BBC Wales version of Doctor Who that can be found in the 24th series. Specifically, the fairy tale look and style of the program is very strong in Paradise Towers, something that was most recently picked up by the last two series. The drama and acting are so strained and obvious that it all comes off as children’s entertainment. The Kangs look like harmless escapees from an off-Broadway play and the camp Caretakers are a joke. The sets are inspired but the lighting keeps them from achieving any real sense of danger or dread. Many fans point to these things as drawbacks but personally I think that they are part of the success of Paradise Towers and series 24 as a whole. After several years of space opera and action/adventure, Doctor Who morphed into a kind of experimental program that posed as one thing but was actually another. I challenge any viewer to find a more saccharine sweet and innocent looking era than the 24th and 25th years of Doctor Who yet they contained some of the most horrific concepts in the programs history nested inside of a colorful kid’s show. The clearest example of this is when Mel is captured by the two Rezzies Tabby and Tilda who trap her in a crochet net and threaten to cook and eat her. Not only that, they reveal that they have been sustaining their rotund figures by luring and eating teenage girls! Paradise Towers is a bit of a failure, to be sure, but it also achieved so many fantastic moments and attempted to transform what had been a safe and predictable program into something entirely new. The characters of Tilda and Tabby and admittedly the only real pieces of evidence for this, but the cliffhanger featuring Mel screaming as they advance on her is completely terrific in its terror. 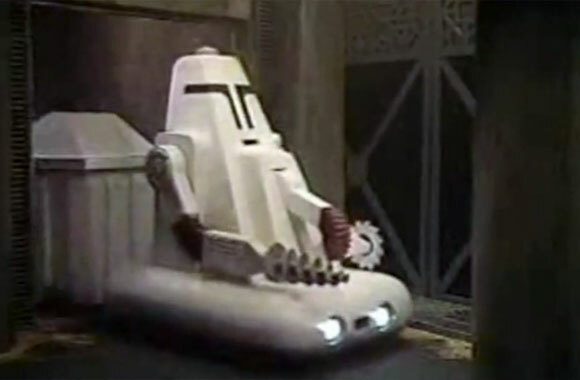 At the insistence of JNT, a monster was called for and the result was ‘the Cleaners,’ by far the most useless robot threat ever seen in Doctor Who. Apparently Cartmel and Wyatt imagined an organic beast pulling people down the waste chutes via tentacles, but this was nixed. Armed with a dull slowly rotating cardboard blade, drill and pincer claw it is not only unclear how they could harm anyone it’s also a mystery to me how they could clean anything! Exactly how does a drill or saw blade remove graffiti? It’s no wonder the towers are so dirty. These things make the War Machines look downright menacing. Celebrity guest stars may seem like a new thing to Doctor Who, but they littered the 1980’s and this story is no exception. Known for his comedic work, Richard Briers is actually quite good as the Chief Caretaker. A bizarre micro-managing Hitler, he never really appears all that dangerous but he is clearly mad and a direct opponent to the Doctor’s mission to fix the problems of Paradise Towers. When he is transformed into a weird robot-zombie, he not only gains a silver sheen and a silly voice but somehow grows a full mustache! What was that all about? I have to admit that when I first saw Paradise Towers I really liked it. I was a fan of the 70’s and 80’s material (I still had no knowledge of the 60’s) but this was so different that I felt some kind of ownership to it. 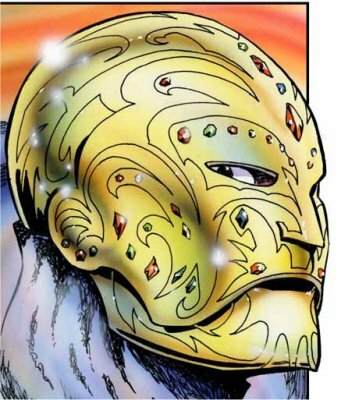 This would certainly not appeal to the average fan of Pyramids of Mars or even Caves of Androzani. The 24th series was so absurd that it made the final Graham Williams efforts such as Nightmare of Eden and Horns of Nimon look sensible. There was a kind of darkly twisted situation comedy element as actors portrayed character types that were very familiar to viewers then took them in a different direction. 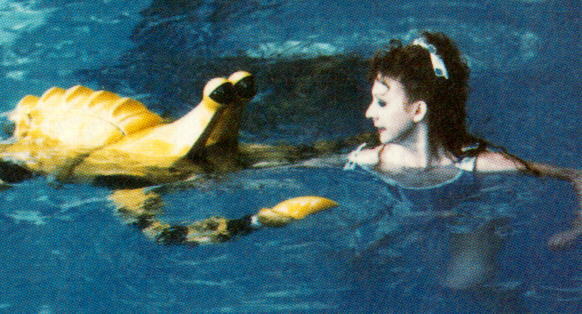 Bonnie Langford gets a lot of stick for her portrayal of Melanie Bush and I can’t say it is entirely undeserved. While her more recent audio dramas vindicate her entirely, on screen she was a perky sprite with a squeaky voice who stumbled into trouble every week. Given that this was a more innocent era of Doctor Who, I couldn’t imagine a more perfect companion to include. Her exchanges of dialog with the Kangs are laughable as she insists that she is a good girl who would never want to be in a gang. Likewise when Pex attempts to impress her with feats of strength his advances bounce right off of her androgynous figure. In the right story, Mel works very well, but one has to remember that she is a simpler character than Leela or Sarah Jane Smith. She is simply a know-it-all who can’t seem to stay out of trouble and is completely incapable of helping herself. This of course allows for the Doctor to be a tactical genius. 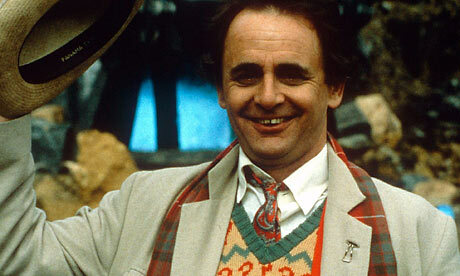 The Seventh Doctor was still a work in progress for Paradise Towers, but you’d never know it to watch the story. McCoy makes the part his own almost immediately with his physical mannerisms and infectious enthusiasm. One can see the influence of Buster Keaton, Stan Laurel and other early film stars in his behavior but all of that melts away in key moments where he interrogates the Chief Caretaker or argues with the inhabitants of the towers to defend themselves. I imagine that the actor was given very little to work with and he certainly filled up the blanks wonderfully. Paradise Towers may not be your kind of thing, but it does feature a very strong performance from McCoy. I do disagree with the Doctor’s ‘brilliant plan’ of asking the monster to come out of his home and then blowing him up. Surely there would have been a better resolution to the situation. Given that the Chief Caretaker was possessed by a great evil and the Doctor had just united the residents, kangs and caretakers in a spirit of peaceful coexistence it seems odd to limit that philosophy and just kill the villain. The BBC Wales program starring David Tennant had a similar view on good and evil and it just never washed with me. If the Doctor is so smart and heroic why doesn’t he at least attempt to save the day without violence instead of formulating a scheme that revolves around explosives? Stephen Wyatt would thankfully return in the following year with the Greatest Show in the Galaxy, an adventure that is still praised by fans as one of the finest Seventh Doctor stories. Featuring quirky characters, an unusual setting and bizarre threats it builds on what was evident here and produces a much more polished end product. Still, I have a soft spot for Paradise Towers. The DVD just released has plenty of extras including a documentary shedding light on the production and even the aborted music score by David Snell. I highly recommend the secondary music track in favor of the naff one by Keff McCulloch that was used on transmission. Neither is perfect, but at least Snell’s is evocative of a mood and doesn’t include synthesized clapping sounds (what was that all about?). If you are a fan of the McCoy era, this DVD belongs in your collection. If you are a devotee of the Tom Baker or Pertwee stories, I’d recommend skipping this one. But if you are a brave soul, you may want to give this one a try and see what Doctor Who was like when it was wild and fearless. Deuchamp 331, a planet where swirling dust constantly whips throughout the landscape, the deafening howl of the wind broken only by a horrifying scream, is an unlikely location for an art gallery. Nevertheless the eccentric Madame Salvadori is engaging an exclusive art show where, according to the Doctor’s diary, Edward Munch’s the Scream went missing. Deep inside the TARDIS, the Doctor has the most deluxe gallery of ‘lost’ masterpieces, saved from the disasters of history. Seeking to ‘rescue’ another painting, the Doctor and Ace arrive to find that an old friend Bev Tarrent is already on Deuchamp 331 looking for a new outlet for her merchandise. Another old friend of the Doctor’s is also on hand, but his intentions are both insidious and insane. Dust Breeding is a clever and traditional-style adventure in the murder mystery turned mad scientist/monster style. I quite like the genre mix and have enjoyed the televised attempts at this kind of thing. Mike Tucker clearly understands the trapping of Classic Doctor Who as all the trappings are there; the strange setting of a screaming planet joined with the absurdly contemporary art snobs, the masked villain, the mysterious deaths, and of course a deadly ravenous monster. The voice acting cast is superb and deliver an impressive job when faced with so many over the top characters I strained my eyes checking and re-checking that Caroline John (Liz Shaw from Doctor Who in 1970) as the cartoonish German accented Madame Salvadori. Of course the real star is Geoffrey Beavers as the mysterious masked man Mr. Seta. 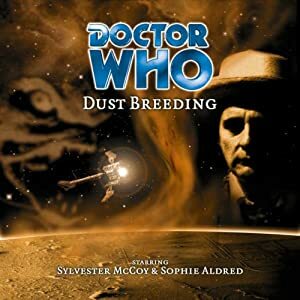 Dust Breeding isn’t a game-changing story or an over-ambitious adventure that challenges the restraints of what Doctor Who can do. In fact, it’s actually a celebration of a typical Doctor Who story and is all the better for it. McCoy revels in his part once more as the charismatic traveler, long before he became the cosmic trickster. I appreciate the many facets of the 7th Doctor, one of the few (perhaps the only one, actually) of the classic Doctors to develop and change over his three-year period. But if given a choice, I prefer the more stripped down traveler/adventurer from McCoy’s first two years on the program. Mike Tucker’s script is paced quite well and feels just like a traditional radio drama, utilizing the audio landscape well to tell a cohesive story without losing the audience. From time to time, the Big Finish audios can dissolve into screams and explosions, making it impossible for the listener to understand quite what is going on. Luckily, that’s not the cae here. There are some dodgey moments as McCoy’s stilted accent gets away from him and Aldred’s voice cracks as she screams in shock and anger (something that sadly happened on screen from time to time). McCoy and Aldred are limited in their acting range, it has to be said, but that doesn’t stop them from being vastly entertaining thanks to their genuine chemistry and personal quirks. The Seventh Doctor and Ace remain one of the best pairings in Doctor Who and they continue that relationship in the audio format. Without giving too much away, Dust Breeding does challenge the canon of the established (if dubious) continuity with the ‘surprise’ return of a long departed foe. I’m unaware of the inconsistencies myself (I read the Virgin New Adventures when they first came out and stopped just short of New Frontier) and I’m just grateful for the return of a much loved character from the classic program. I hope that we get to see (hear?) him again. 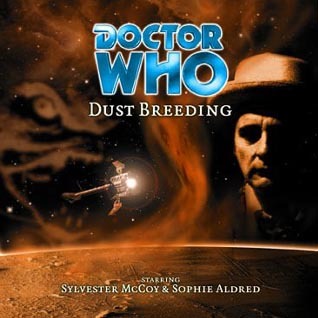 Doctor Who – Dust Breeding can be purchased at local retailers such as Mike’s Comics and online from Big Finish. Read other Big Finish reviews at the Daily P.O.P. here. The Seventh incarnation of the Doctor and Ace arrive on the planet Kar-Charrat to return a book that the Doctor had forgotten he had taken out of the largest repository of knowledge in the galaxy. Unknown to them, a small group of thieves are attempting to steal a precious archeological item from the planet. Few have ever braved a visit to Kar-Charrat for fear of the fabled ghosts that occupy its tropical world. While it houses the largest amount of data ever assembled in one place, the library of Kar-Charrat is a mysterious institution that only time sensitives can even gain access to. When the Doctor arrives, the chief librarian Elgin is anxious to show off the state of the art wetworks facility that the library has installed to store all of their data, making all other forms of storage unnecessary. 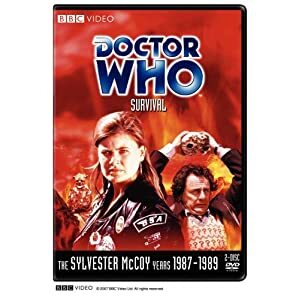 The Doctor is of course interested, but Ace throws a fit and is left out in the rain where she hears strange ethereal voices and meets the only survivor of the ambitious group of thieves, Bev Tarrant. The pair soon find that they are not the only visitors to the secluded planet and encounter a lone Dalek scouting the area for time sensitives. 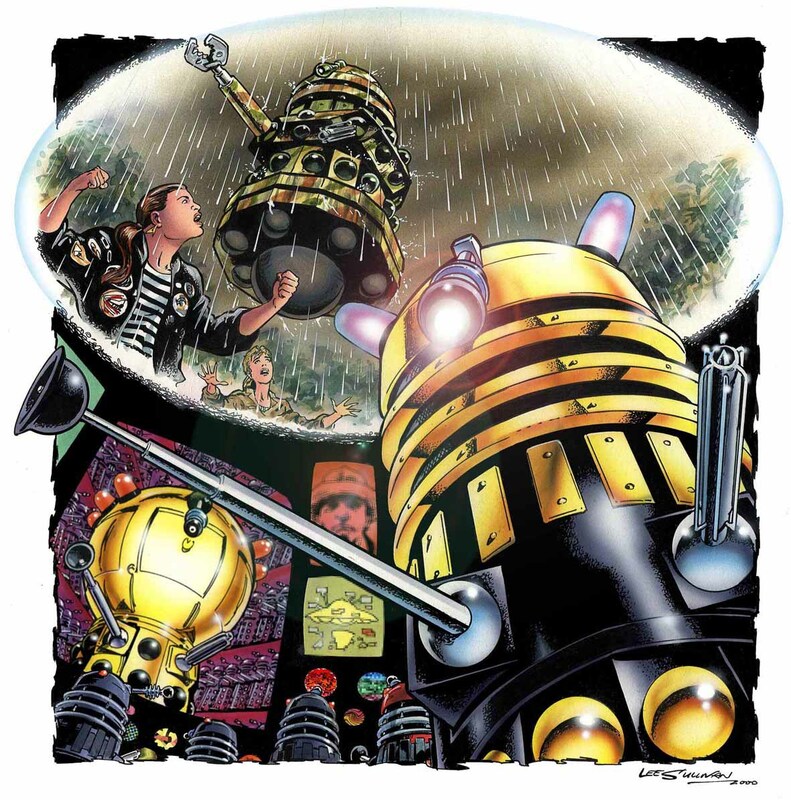 The debut audio story for the Daleks in a Big Finish Production is also a tie-in to the excellent Dalek Empire series running concurrently at the time (click here for my review of part one, I promise to get to the remaining three installments in due time). Written by Mike Tucker (better to known for his award-winning special effects work on classic and new Doctor Who, Red Dwarf and other programs), the script is very intelligently written, bringing new menace to the Daleks that had not been seen in Doctor Who since the 60’s. When I first heard of the audio adventures featuring the Daleks I was skeptical. How can listening to a distorted screaming voice be entertaining? How wrong I was. On screen the Daleks had become lackeys to their creator Davros in the 1980’s, losing the spotlight to the megalomaniacal scientist. I was surprised to find that in audio format, the Daleks flourished. In their own serial Dalek Empire, the monsters proved that they could be manipulative and ruthlessly driven in their quest for total galactic conquest. This characterization carries over in the Genocide Machine, an adventure that builds upon a key component of their plan explored in Dalek Empire. In fact, all four of the Dalek Empire cross-overs (The Genocide Machine, The Mutant Phase, The Apocalypse Element and Time of the Daleks) deal with specific items that the Daleks have acquired in their master plan to conquer the universe. After the cancellation of the TV program, the Seventh Doctor and Ace had continued to develop in print through a series of books published by Virgin. This continuation of the ideas explored on-screen resulted in emotionally-charged and dynamic epics that built an entirely new universe of stories, most of which could not have been produced for television for various reasons. The New Adventures series has its ups and downs and when Big Finish decided to take up the mantle of Doctor Who, it was unclear to me if they would pick up from the novels or the TV stories. In the end, BF tried both, but personally I find that the New Adventures material works best in print rather than audio. The Genocide Machine is set sometime after the final TV adventure, 1989’s Survival, when Ace is still a spunky young woman and not a jaded ex-soldier with issues about trusting the Doctor. The Doctor isn’t exactly the cosmic trickster that the Virgin novels transformed him into and is more of an explorer traveling the universe fighting injustice. McCoy and Aldred revisit the characters from many years ago like they had never left them. One of my favorite pairings on-screen, they had a special chemistry rarely seen in Doctor Who (with the Fourth Doctor and Sarah Jane Smith being a prime example). After getting kicked out of the library, the defiant and headstrong Ace soon finds herself neck-deep in trouble that is far too much for her to handle just as the Doctor discovers that he has arrived too late to stop the Daleks from visiting the library. Unfortunately, only the Doctor can seem to understand what it could mean should the library’s knowledge fall into the Daleks’ control. The Genocide Machine is a well-paced adventure that never stops moving from start to finish. Much like Whispers of Terror and Land of the Dead, it also introduces stunning concepts that I will not mention here to avoid spoiling the surprise for first-time listeners.Veteran Dalek-phile and voice actor Nicholas Briggs once again brings his unique flair to Terry Nation’s monsters, making them cunning and maniacal all at once. There are plenty of twists and turns in this four part story that further complicate matters and as I enjoy Doctor Who stories in which our hero appears to be out-gunned and out-classed, this earned top marks from me. After seeing the Daleks on screen in countless stories, one would think that they would lose their appeal and power. In the case of the BBC Wales production, this is largely the case. However, in the unlikeliest of mediums, audio, the Daleks have discovered a new realm of fear. 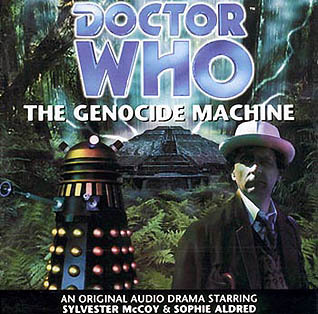 Doctor Who – The Genocide Machine can be purchased at local retailers such as Mike’s Comics and online from Big Finish. The McCoy era saw some dramatic changes in the character of the Doctor as the program entered a new age of greatness. 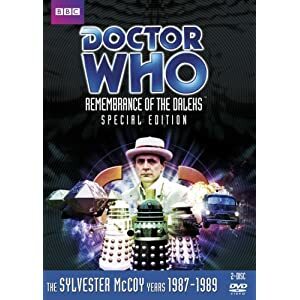 Classic adventures such as Remembrance of the Daleks, Greatest Show in the Galaxy, Curse of Feric and more showed that the series thought tired and ready for the scrap heap had some life in it yet. What was intended to be McCoy’s fourth and final series would have pushed the envelope even further, introducing a new companion as the ultimate destiny of Ace was revealed. Yet, this was not to be. Doctor Who was retired in 1989 and would take a long time to return. 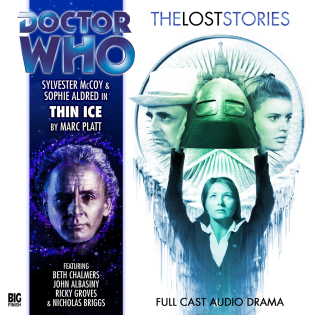 However, the creators and cast of these ‘lost stories’ have convened at Big Finish to bring the adventures that we thought would never be seen to our ears. The story takes the Doctor and Ace to Russia in the 1960s, where some alien artifacts have fallen into Soviet hands… and others are trying to obtain them. Meanwhile Beth Chalmers – who will debut as the Doctor’s new companion Raine next month – plays Lt Raina Kerenskaya/Sezhyr in Thin Ice. Pre-order The Lost Stories: Season 27 at Big Finish! For anyone looking to subscribe or re-subscribe, we thought it might be a good idea to let you know which Doctors will be appearing in which of the upcoming main range, monthly releases. 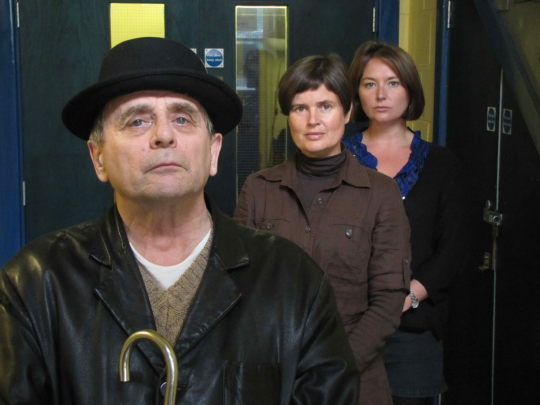 As you will see from the production details on the site, Sylvester McCoy’s latest batch of adventures take us up until September 2011. Following that, from October to December 2011, Paul McGann returns as the Eighth Doctor, with Julie Cox as new companion Mary Shelley. We were hoping to make this announcement exclusively in the pages of Doctor Who Magazine, but unfortunately, an over-enthusiastic cast member from one of these productions, included the news in his personal podcast! You may remember that the character of Mary Shelley originally featured in the Doctor Who story The Company of Friends. If you haven’t heard that one yet, you might like to catch up with it now. And look out for this week’s BF Podcast, in which Julie and Paul will be giving us a teaser of their new adventures. Following on from the Eighth Doctor adventures, January 2012 sees the beginning of a new mini-season of Sixth Doctor adventures starring Colin Baker. They run from January to March.